On our third day in Camiguin, April 10, Tuesday, we opted to do some island hopping and what better place to go than to White Island. After lunch, we proceeded to Caves Beach & Dive Resort along Agoho Beach in Brgy. Agoho. About 1,5 to 2 kms. 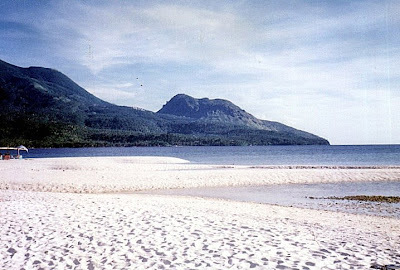 offshore is the C-shaped, picture-perfect White Island, Camiguin’s pride. 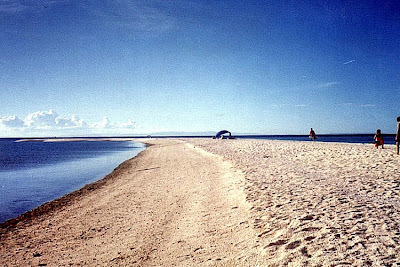 Also called Medano Island, it is a small, uninhabited and treeless sandbar with dazzling white, sugar-fine sand.The island’s shape differs depending on the tides and the constantly shifting currents. 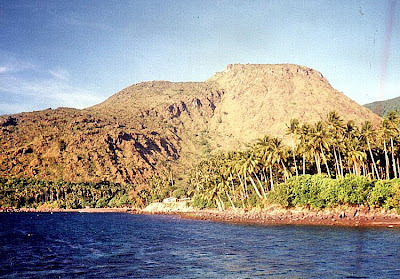 The island is also accessible from Brgy. Yumbing, at a boat station behind Paras Beach Resort. We hired two pumpboats at PhP250 per boat to ferry our group and we reached the island after a 15-min. boat ride. 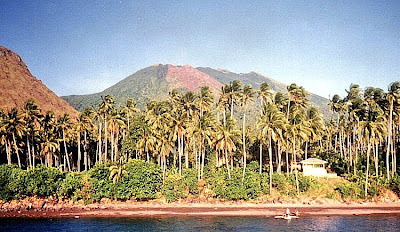 The island’s postcard-perfect view was marred by the sight of makeshift stalls and tents doing brisk business selling buko juice, soft drinks, beer and snacks to visitors at the southern end of the island. It being the Holy Week, I could only sigh in disbelief at the sight. However, they do provide temporary shelter and good shade from the hot afternoon sun. 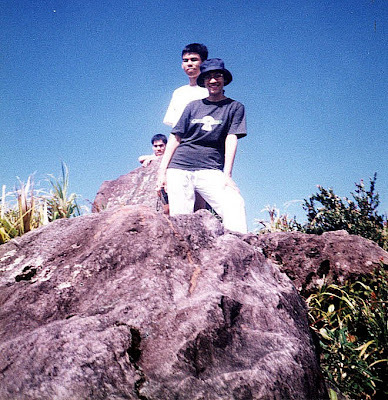 Still, nothing can mar the backdrop of picturesque and majestic Mt. 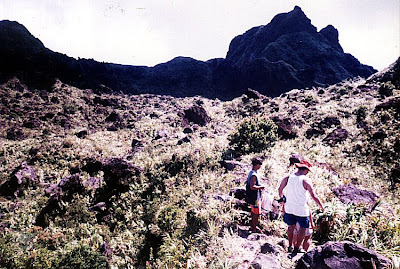 Hibok-Hibok and Mt. Vulcan Daan. The ladies were off to their usual sunbathing while the guys went snorkeling and swimming 150-200 m. off the island. Later, as the afternoon wore off into evening, we were rewarded by a beautiful sunset. 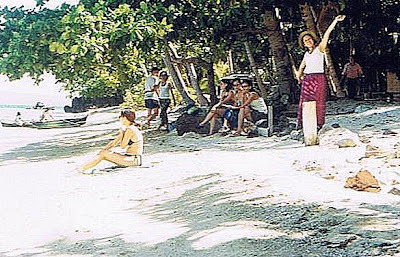 The island shrinks substantially during high tide, so visit early in the morning or late in the afternoon. Not visiting the island would be like not visiting Camiguin at all. From Cotta Bato, we made a short drive to the Sunken Cemetery, site of the community cemetery which sank during the 1871 eruption. After paying a PhP2 entrance fee, we proceeded down the hill to secluded, brown-sand Sabang Beach. About 200 m. offshore is the huge concrete white cross which was built from 1997 to 1999 to replace another installed further offshore in 1982. 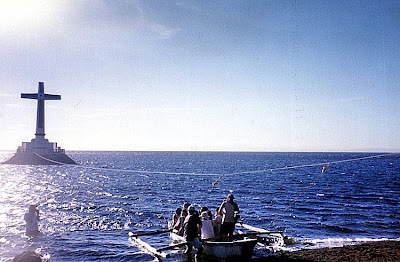 Connecting the cross with the shore is a nylon rope from which is tethered a boat for crossing. We paid PhP10 each for the two-way trip. According to the boatman, years ago, gravestones were still visible during low tide. Now they can no longer be seen. Every year, on May 1, a fluvial procession is held there. The islanders row out to offer flowers and floating candles to the dead. 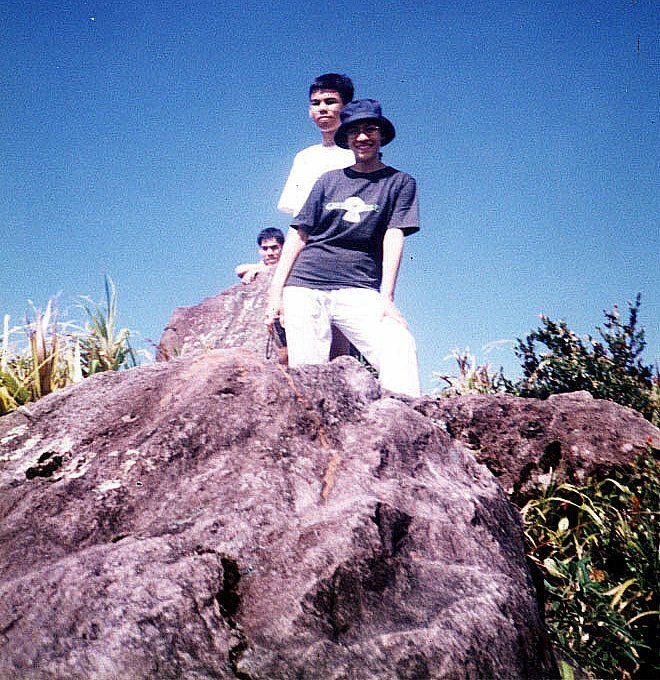 From our vantage poin at its terracet, we had a panoramic view of Mts. 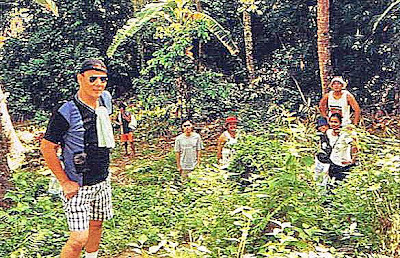 Vulcan Daan and Tres Marias. Scattered along Mt. Vulcan Daan’s northwestern slope is a winding trail with life-size, white-washed cement figures of the 14 Stations of the Cross depicting the passion death and resurrection of Jesus Christ. The last station is a sepulcher carved out of volcanic rock. During Holy Week, a Panaad is held for religious retreat and penitence. It features a 2-day, 64-km. 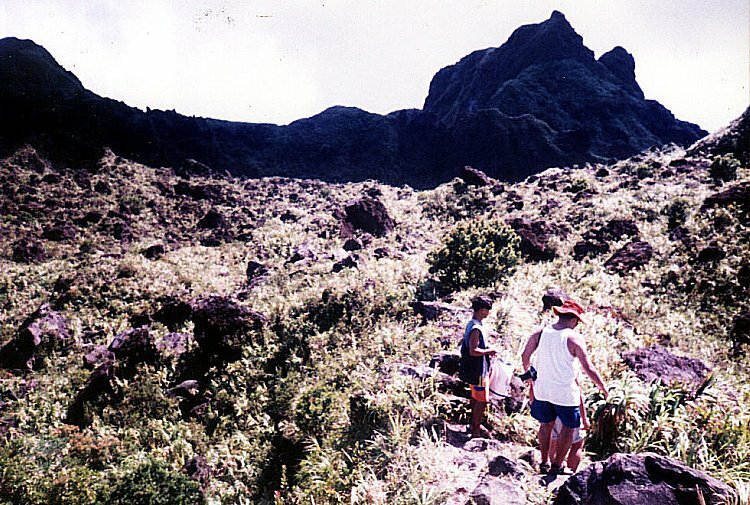 trek around the island, from Brgy. Benoni to the Stations of the Cross. The sun was just setting when we returned to shore and a well-deserved rest back at the resort. From Sto. Nino Cold Spring, a 30-min. 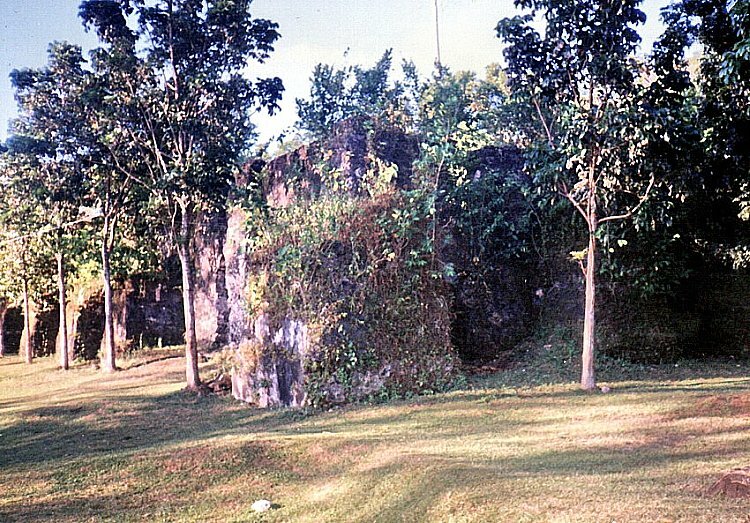 drive brought us to the ruins of the old Gui-ob Church (Cotta Batto) in Catarman. This coral and stone-hewn church, Camiguin’s version of Albay’s Cagsawa Ruins, is located 16 kms. from Catarman and 20 kms. from Mambajao proper. It was built in 1623 as the parish of San Roque before it was half buried by lava flows during the May 1, 1871 eruption of the 838-m. high Vulcan Daan (locally called Tandang Bulkan) which destroyed the town. Within its thick, century-old adobe walls is a makeshift chapel. A short distance away is the bell tower and a moss and vine-covered convento, reminiscent of the Spanish era. Viewed in the late afternoon sun, all three made nice subjects for a photo shoot. Old Guiob Church Ruins: National Highway, Brgy. 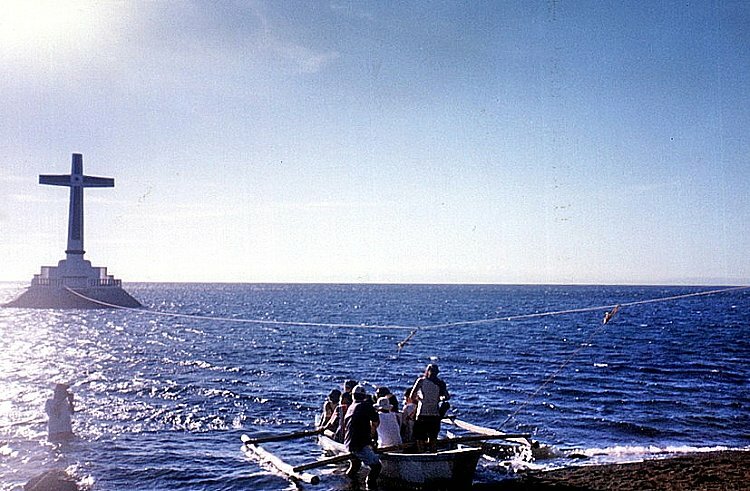 Bonbon, Catarman, Camiguin. 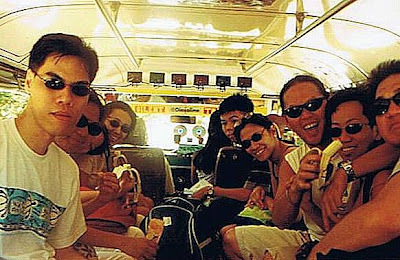 After our delightful lunch at Taguines Lagoon, we again boarded our hired jeepney and proceeded, along the west coast of the island, to Sto. Nino Cold Spring. Also known as Kiyab Pool, it is located 4 kms. 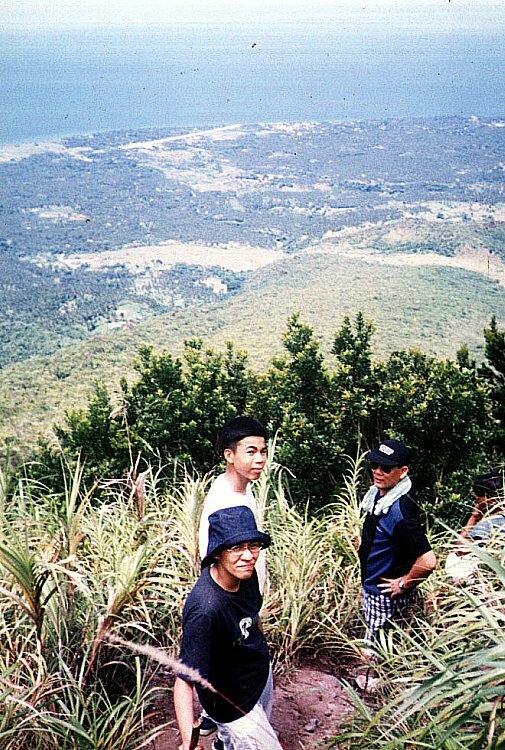 north and uphill of Catarman town proper. From the main road, we made a turn into 2-km. long dusty track. The spring has 2 stone pools, the larger one measuring 25 m. by 40 m. and its depth varies from one-half meter to 2 m.. The other is a kiddie pool. The resort also has picnic huts, toilets, function hall and native stores for picnickers. Being a holiday, the resort was packed with picnickers. After paying an entrance fee, we swam its icy-cold, crystal-clear spring water sprouting from its sandy bottom. We shared the spring waters with some tiny fish. After half an hour of swimming, we left the resort by 4 PM. Sto. Nino Cold Spring: Brgy. 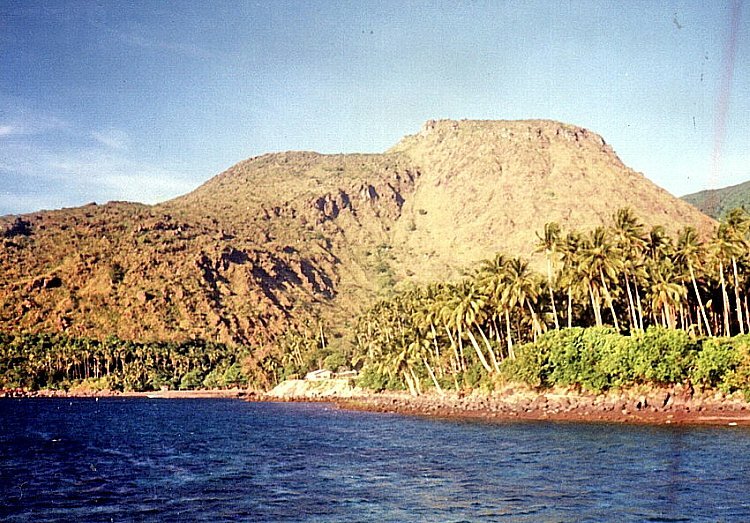 Mainit, Catarman, Camiguin. Admission: PhP20/pax. We all left Katibawan Falls by 11 AM and proceeded on a 40-min. drive to Taguines Lagoon, near Benoni Port, for lunch. This beautiful artificial lake has mantles of limpid water surrounded by craggy cliffs, huge boulders and gently rolling hills. 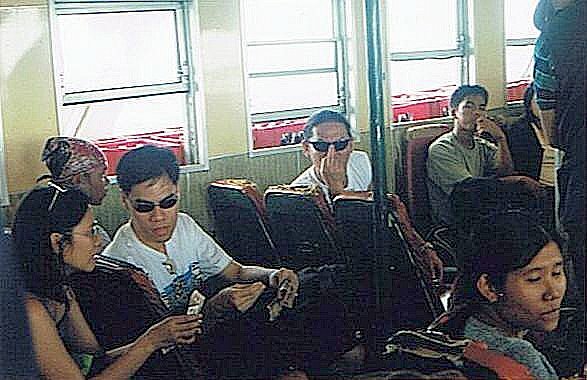 Truly, a relaxing break from a tiring tour around the island. We stopped at J.A. Fishpen, a restaurant on stilts overlooking the lagoon. 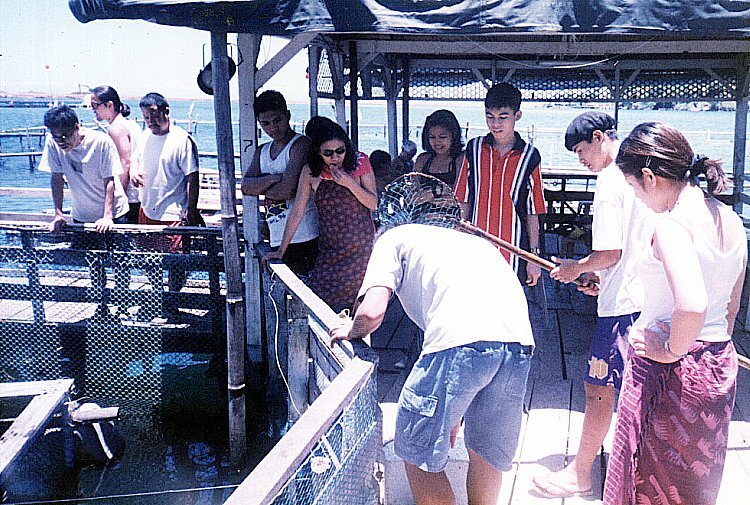 Around it are fishpens where bangus (milkfish), mamsa (jack), lunab (surgeonfish), katambak (spadefish), danggit (seganid), maming (parrotfish), kitong and alimango (crabs) are bred. Quite hungry, we feasted, kamayan-style, on fresh-caught and cooked alimango. kitong and bangus, plus fried chicken, pancit canton and halaan soup and washed it all down with buko and green mango shakes. J.A. Fishpen: Brgy. 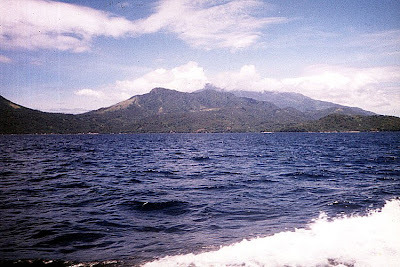 Benoni, Mahinog, Camiguin. Tel: (088) 387-4008. After an early-morning breakfast at the resort’s restaurant, we left at 8:30 AM for our island tour. The day before, we contracted our jeepney drivers, Rico and Charlie, to give us a tour around the island for PhP1,500. 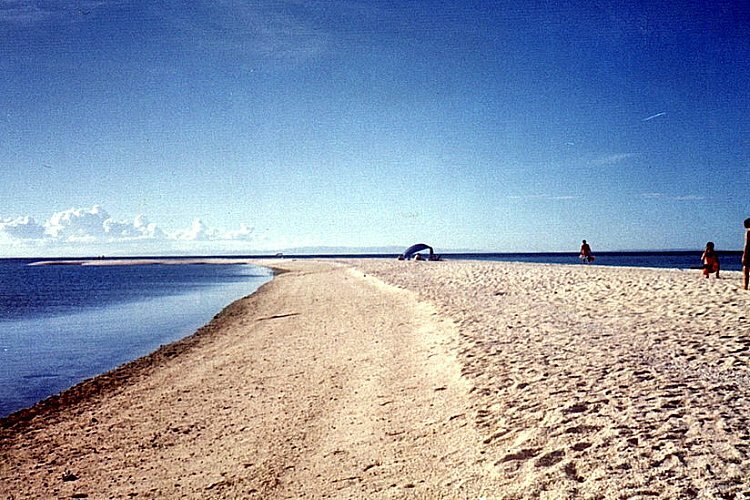 The 5 towns of Camiguin (Catarman, Guinsiliban, Mahinog, Mambajao and Sagay) are all connected by a 64-km. long, almost all concreted circumferential coastal road which can be circumnavigated in a 3-hr. drive. While Jandy and I stayed inside the jeepney, the others sat on the roof, always on the lookout for trees while enjoying the cool breeze. 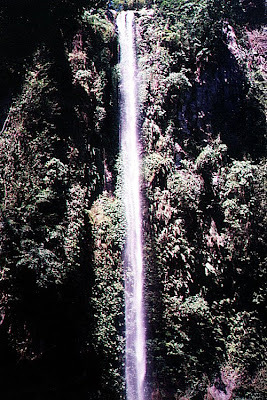 Our first stop was the 76.2-m. (250-ft. ) high Katibawasan Falls. Located 5 kms. 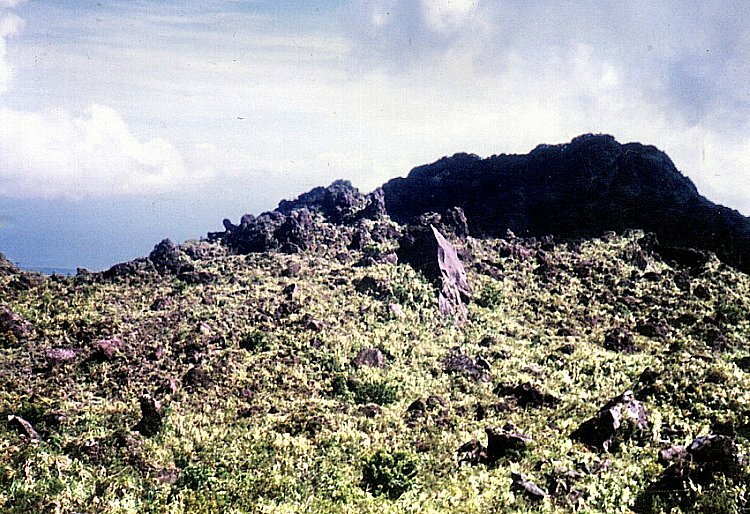 southeast of Mambajao, on the 1,420-m. high Mt. Mambajao, a dormant volcano, it is one of the highest waterfalls in the country. After paying the PhP10 entrance fee, we descended a 67-step concrete stairway, passed a view deck, and beheld one of the most beautiful waterfalls I have so far seen in the country. The slim waterfall cascades precipitously down to a rock pool teeming with fresh water shrimps and is surrounded by a massive granite mountain wall swathed with ground orchids, wild ferns, trees and boulders. Eden reincarnated! We were soon down to our swimming attire but hesitated upon finding out that the waters were icy-cold. What the heck! 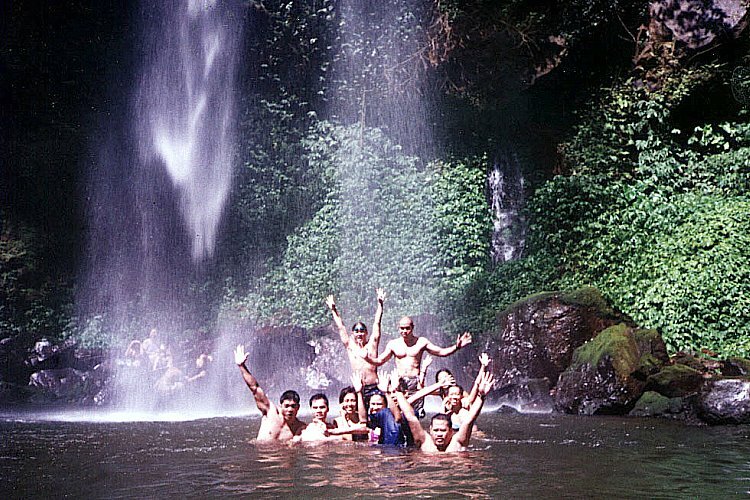 Lest I change my mind, I quickly jumped in, shivering for some time until my body temperature adjusted to the coldness. Jandy and the others soon followed suit. The rock pool was shallow except at the area were the falls hit the water. We stationed ourselves at the boulders underneath the falls, feeling the cascading waters massage our backs. Nature’s hydromassage. Near the falls is a resthouse for changing and a cottage for overnight stays. Katibawasan Fall: Brgy. 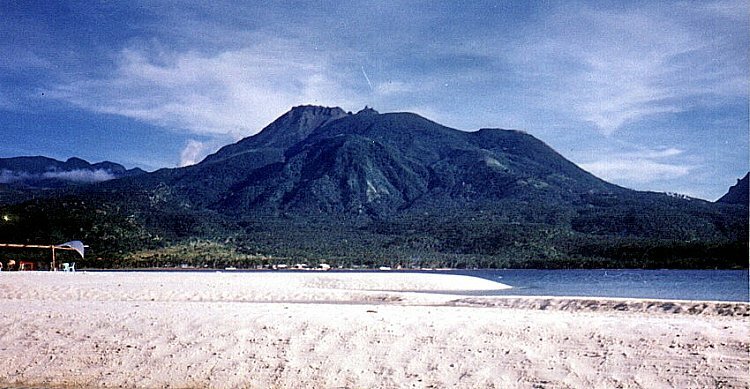 Soro-Soro, Mambajao, Camiguin. Upon landing, we ask around and were able to hire a jeepney, pakyaw-style, to check on available accommodations at Mambajao. We just about checked all the resorts and hotels and most were either fully booked or simply inadequate for our tastes and needs. In the end, we all decided on Dayon sa Cabuaan Beach Resort along Cabuaan Beach. 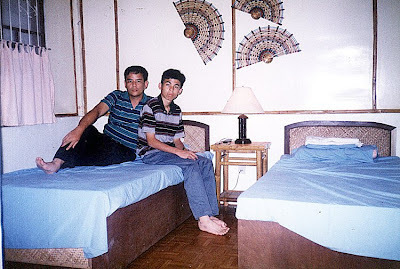 Our group occupied 4 (Jandy and I occupied one) of the resort’s 8 airconditioned cottages with bath and cable TV. The resort also has five 5-pax airconditioned rooms with bath, a restaurant. The resort was one of only two places (the other was Mt. Hibok-Hibok) where I could get a SMART signal for my mobile phone. Camiguin was definitely GLOBE country. 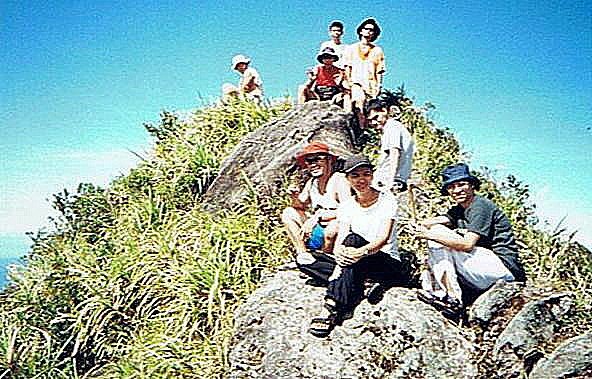 Since it was already late in the afternoon, we decided to rest and explore the island the next day. Dayon sa Cabua-an Beach Resort: Cabua-an Beach, Mambajao, Camiguin. Tel: (088) 387-2103.